ISOMA's 12-Piece Gold Personal Brush Set is a set of 12 of the most useful and popular brushes for enhancing and beautifying the face. This elegant set is ideal for the makeup artist’s personal use or it may be given to the talent to use as a personal set, studio set, and/or travel set, or it may also be presented as an appreciative gift to a friend or someone special in the industry. These exquisite beautifying brushes are individually sheathed in a luxurious gold organizer wallet which is held closed with two snap closures. The 12-Piece Gold Personal Brush Set consists of the following mid-size brushes: powder brush; blush brush; contour brush; large eyelid brush; medium eyelid brush; small eyelid brush; under-eye camouflage brush; eyeliner brush; eyebrow brush; eyelash/brow brush; spiral brush; lipstick brush. 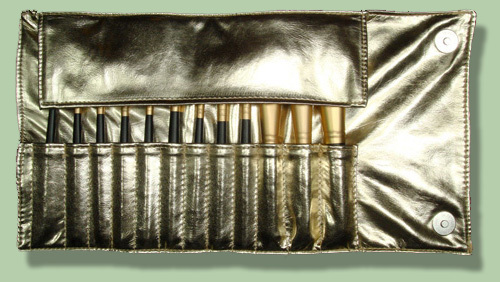 This desirable 12-piece set is available in three luxuriously rich sets: a silver brush set encased in a silver wallet; a gold and black brush set encased in a gold wallet; and a gold and black brush set encased in a black wallet. An original creation by ISOMA. 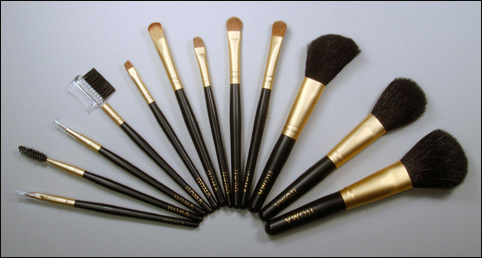 The 12-Piece Gold Personal Brush Set that is shown in the above photo with the ISOMA name in black, is only available with the ISOMA name embossed in gold on the cover of the case at this time. 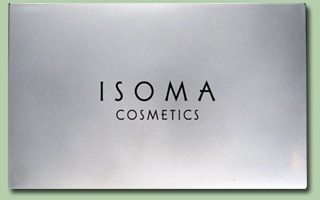 The 12-Piece Gold Personal Brush Set with the ISOMA name in black is out of stock and will be available at a later date. 1. Luxurious powder brush . . . This is a sumptuously soft, large, full and dense brush that is tapered at the ends. It is excellent for applying a sheer amount of powder to the face in order to set the makeup and eliminate shine. Also, it may be used to dust a light amount of powder on the face in order to blend and soften blush colors. It is useful for applying loose and pressed powder. 2. Plush blush brush . . . This is a very popular full-bodied, plush blush brush that is gently soft-to-the-touch and is tapered at the ends. It is used for applying just the right amount of blush to the cheeks and face to create a smooth even application of blush for natural, fashion character, unique and special effect looks. It may also be used for applying contour or highlights to the face or body. 3. Flawless angled contour brush . . . This is a soft-to-the-touch full-bodied brush that is angled and tapered at the ends. Its design is specially angled for applying contour color in a meticulous manner to the skin to sculpt the contour areas of the face and neck in a gentle soothing manner. 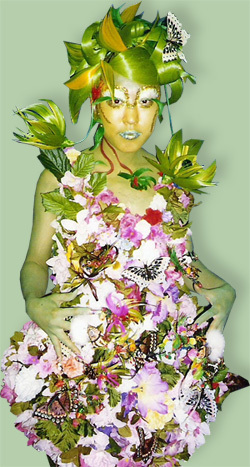 It may also be used for applying a small amount of blush or highlights to the face or body for natural, fashion, character, unique or special effect looks. 4. Classic eyelid/under eye camouflage brush . . . A high-quality classic style nylon brush that is shaped like a fluff brush with tapered ends. It is used as an under eye concealer brush and it may also be used as an eyelid brush to apply cream or water-based eyeshadow or eyeliner products to enhance the eyes for natural, fashion, character, unique, or special effect looks. It is a firm, but supple brush that may be used to apply cream or liquid products to all areas of the face and skin to create a smooth and flawless appearance. One may apply a sheer, medium or opaque amount of coverage as desired. 5. Classic eyeshadow brush I . . . A large size of the classic eyeshadow brush. It is a soft, but firm, oval-shaped brush that is made of natural hair and is tapered at the ends. Its classic size has been the industry standard for picking up and smoothly applying and blending eyeshadow colors to the eyelid areas for natural, fashion, character, unique, or special effect eye looks, or for enhancing the eyelid with highlighting colors. 6. Classic eyeshadow brush II . . . A medium size classic eyeshadow brush. It is a soft, but firm, oval-shaped brush that is made of natural hair and is tapered at the ends. Its classic size has been the industry standard for picking up and smoothly applying and blending small amounts of eyeshadow colors to the eyelid areas for natural, fashion, character, unique, or special effect eye looks, or for enhancing the eyelid with highlighting colors. 7. Classic eyeshadow brush III . . . A small size classic eyeshadow brush. It is a soft, but firm, oval-shaped brush that is made of natural hair and is tapered at the ends. Its classic size has been the industry standard for picking up and smoothly applying and blending small amounts of eyeshadow colors to the eyelid areas for natural, fashion, character, unique, or special effect eye looks, or for enhancing the eyelid with highlighting colors..
8. Eyeliner brush . . . This is a slender, fine-tipped brush that is tapered at the ends. It is ideal for lining the eyes, and creating fine lines for tattoos, veins, etc., for natural, fashion, character, unique or special effect looks. It may also be used for applying camouflage products to cover small blemishes, freckles, old age spots, veins, birth marks, tattoos, scars, etc. 9. Angled eyebrow brush . . . A firm angled brush that is made especially for applying brush-on-brow products to the eyebrows in order to create definition and a rich enhancement of the eyebrows and eyes. It may also be used to soften brush-on-brow products and eyebrow pencil designs that have been applied too strongly to the eyebrow area. 10. Eyebrow brush/eyelash comb . . . This is a dual-purpose makeup tool that has a brush on one side that is made of nylon and is used for brushing the eyebrows into the desired shape for natural, fashion, character unique or special effect looks. On the opposite side of this brush is a comb with fine plastic teeth that is used for separating the eyelashes that may cling together during mascara application and for removing excess mascara from the lashes. The brush side may also be used for cleaning artificial lashes and applying graying or darkening color products to the face hair or head hair for various natural, fashion, character, unique or special effect looks. 11. Spiral brush . . . This is a uniquely shaped brush that is arranged in a spiral design like a mascara wand applicator. This popular brush is made of nylon and is easy to clean and dry quickly. It is used for separating the eyelashes, removing excess mascara from the lashes, grooming the eyebrows, and applying graying or darkening color products to the face or head hair for various natural, fashion, character, unique or special effect looks. 12. Classic lipstick brush . . . This classic style lipstick brush may be used for mixing lipsticks on a spatula in order to create customized colors and for applying lipstick and lip gloss to the lips in a smooth, quick and precise manner. It is ideal for enhancing and defining the lips to create various lip designs. This useful multi-purpose brush may also be used for lining the eyes, creating fashion, character, unique and special effect eye looks with powder or cream products. It may also be used for applying camouflage products to cover small blemishes, freckles, old age spots, veins, birth marks, tattoos, scars, etc. The 12-Piece Gold Personal Brush Set Holder is an attractive, sturdy, well-crafted textured holder that is cleanable with a soft cloth and a mild cleanser. If properly cared for, the holder will help keep your brushes in an orderly manner and well-maintained condition for many years. 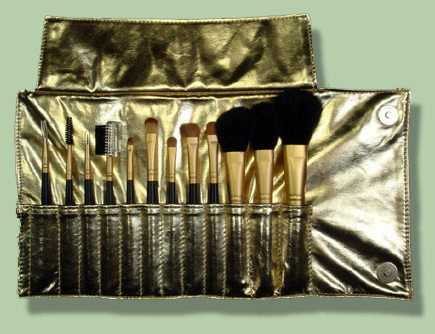 The 12-Piece Gold Personal Brush Set Holder is 13 1/4 inches wide x 4 inches high when it is opened and is 7 1/4 inches wide x 4 inches high when it is closed. 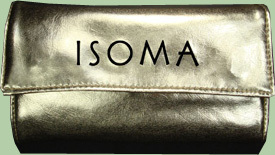 The 12-Piece Gold Personal Brush Set comes in its own brush holder and is placed in a rich looking gift box with the ISOMA name proudly displayed on both.